I ate this rather delicious soup at a very depressing roadside restaurant just outside Istanbul. After a torturous 8 hour bus journey it was just what I needed, but unfortunately it also gave me the worst bout of “downstairs problems” I’d had in a long time. I decided to give myself a trip down memory lane by recreating the magic at home. Thankfully all is well downstairs this time. 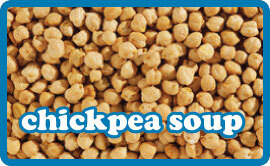 Blend 1 cup of the chickpeas in a food processor or with a hand blender into a smooth paste. Heat the stock in a large pan and add the chickpea paste and mix well. Add the remaining chickpeas. Cook on a low heat for 25 minutes. Add the butter to the soup and stir in. Add half of the mint and season with salt & pepper to your taste. Pour into bowls, and sprinkle the remaining mint and a wedge of lemon to squeeze over.